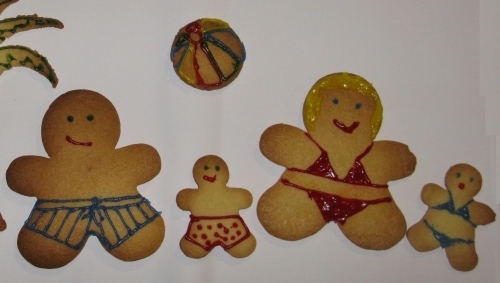 The September 2010 Daring Bakers' challenge was hosted by Mandy of "What the Fruitcake?!" Mandy challenged everyone to make Decorated Sugar Cookies based on recipes from Peggy Porschen and The Joy of Baking. The appeal of Sugar Cookies is the chance to be creative, a chance to tip out all of your cookie cutters, decorating gels, piping bags and sprinkles and unleash them upon a small ball of unsuspecting dough. To be honest, I don't actually like the cookies themselves, I much prefer a crumbly textured, chewy cookie that is dropped in random blobs on a tray and baked, like an Anzac or giant choc chip cookie. But I have always wanted to make them, and this month was presented with the challenge by the Daring Bakers. Our only mandatory conditions were that we had to use the recipe supplied, and we had to decorate them, specifically with the theme of "September" and whatever creative spark that ignited. Unfortunately my spark simply fizzled. I could imagine Christmas snowflakes sparkling with decorators' sugar, or a set of science cookies to contribute to Ms Humbles monthly round up, but September drew a blank. No weddings, birthdays, baby showers or anniversaries. There was one very sad family occasion, but not to be celebrated with cookies. This, and the fact that I only own one type of cookie cutter, a set of three gingerbread men cutters, meant I didn't actually start baking until one day before the deadline. My results aren't fantastic, I had the cookies perfectly baked and cooling in the oven, when a few hours later I cranked up the temp to bake my Pear, Apple and Cheddar Pie. When I remembered 20 mins later, my cookies were looking a little worse for wear. It was then that I decided to create a beach scene to celebrate spring and the weather finally getting warm enough for a dip. Instead of being burnt, my little people are now just "sunburnt" and sending a sun safe message about skin cancer. When I have proper inspiration I will definitely remake these, they are simple and surprisingly tasty. They definitely allow you to unleash something creative, and a browse through the cake decorating aisle in Spotlight will make a dent in your finances. I challenge you to give it a go, and also check out the fantastic work of other bakers on the Daring Bakers site. Original recipe PDF available here. Very simple pantry items are required, sugar, flour, vanilla, egg. This is the full recipe, I halved it to produce my cookies. Cream together 200g unsalted butter at room temperature, with 200g caster sugar and 5mL vanilla extract until just creamy, don't beat as much as you would for a cake. Beat in one large egg until just incorporated. Add 400g sifted plain flour and gently incorporate on a low speed. Tip onto a lightly floured surface and lightly knead into a ball. Divide into 2-3 portions and place each between two pieces of baking or parchment paper. Roll out to a thickness of 5mm, then place in fridge for at least 30mins. Once chilled, take off top piece of paper and lay face down on lightly floured surface. Gently peel off second piece of paper. Cut into desired shapes, place gently on oven tray. Scraps can be kneaded together and the process repeated until all dough is used. Bake at 180° for 8-15 mins until golden around the edges. Once cool, decorate as desired using royal icing (recipe in original pdf), gels, sprinkles, lollies: whatever you can imagine. Eat or store in an airtight container for a week if decorated, or a month if plain. 2 Haha! I love that you turned them from "a little burnt" to "a little sunburnt" - that is awesome. Really well done. 3 Love little baby Borat, and that your biscuits are promoting skin cancer education, too! 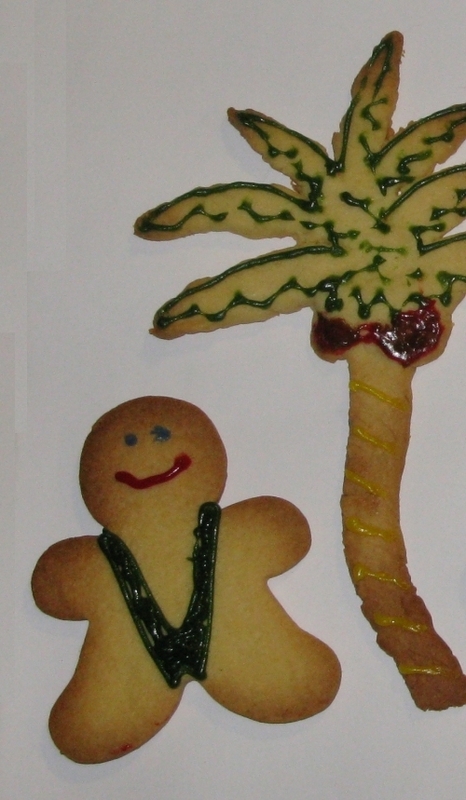 4 LOL, I adore your sunburnt beach cookies!!! Way to make lemonade out of lemons!! They are way cute! 5 I love your cookies.....esp the borat one ha ha ha ha, love love love them. thank you for your suggestion. I look forward to meet you again. btw, I love your Borat cookies!